If your shopping cart contains items from multiple shops, you must pay each seller individually. You have to complete the checkout process for each shop separately. 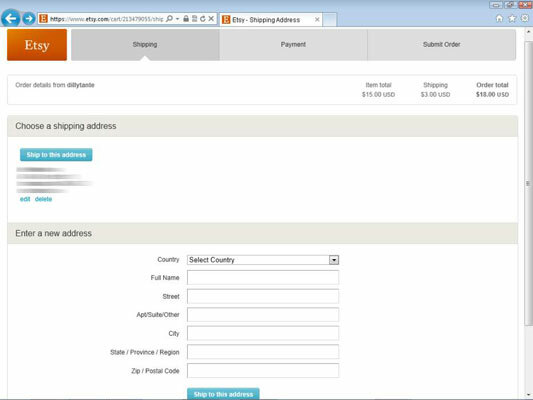 If the address you want to use is shown on the screen, click the Ship to This Address button that appears above it. Otherwise, enter a new address in the fields provided and click the Ship to This Address button that appears underneath. Select the credit card you want to use or, in the case of a gift card, enter the redemption code and click the Redeem Now button; then click Continue. If you haven’t yet entered a credit card number for use on Etsy, you’ll be prompted to do so. A page that enables you to review and submit your order appears. To change the address, click the Change link and choose from the list of alternate addresses that appears. To add a new address, click the Add a New Address link and follow the onscreen instructions. Choose your method of funding. Review your information and click Continue. PayPal returns you to the Etsy site. To find out how to submit your order, read on. Don’t have a PayPal account? Don’t worry. Setting one up is as easy as pie. You can even do it from Etsy during the checkout process. 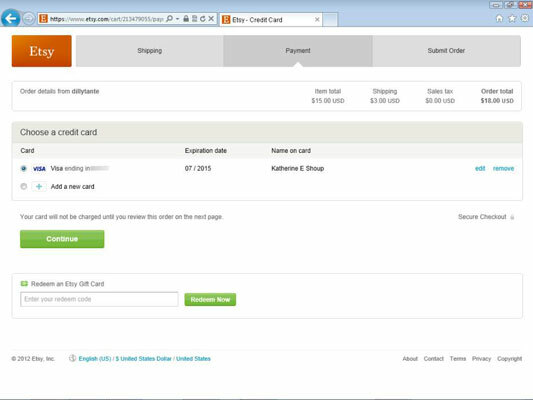 Simply choose PayPal as your payment method, and click the Check Out with PayPal button. Then, when you’re prompted to pay, follow the onscreen instructions to register for a PayPal account. In some cases, you may also be able to use PayPal to pay for your purchase with a credit card — for example, if the seller doesn’t offer Direct Checkout. To do so, again choose PayPal as your payment method and click the Check Out with PayPal button. Then, when you’re prompted to pay, click the Continue Checkout link on the left side of the page and follow the prompts. If you opted to pay via check or money order, you’ll want to convo the seller to make the appropriate arrangements.